Good. Light scratches to discs. Clean inserts. Case has light scratches/scuffs. Claudio Monteverdi. Fine. In fine packaging. 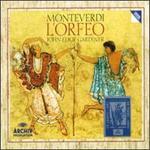 The Monteverdi Choir-Monteverdi: L'Orfeo by The Monteverdi Choir. Claudio Monteverdi. Very Good. In very good packaging. Monteverdi: L'Orfeo by The Monteverdi Choir. Fine. 028941925022 FAST, RELIABLE, GUARANTEED and happily SHIPPED WITHIN 1 BUSINESS DAY! INTERNATIONAL CUSTOMERS: International rate shown is for items that are 8 oz or less; heavier items WILL REQUIRE additional shipping. Contact us if you have any questions. Outer cardboard sleeve contains chubby case with 2 discs and booklet. Perfect except not sealed. Ask about discounted shipping available when multiple items are purchased at the same time. Like New. Booklet included. All in cardboard sleeve.